White Cake Mrs. Morris. 1 cup sugar 1/2 cup butter 1/2 cup sweet milk 1 cup flour 1 cup corn starch 4 eggs the whites 1 teaspoon cream tartar 1/2 teaspoon soda. Nameless Cake. 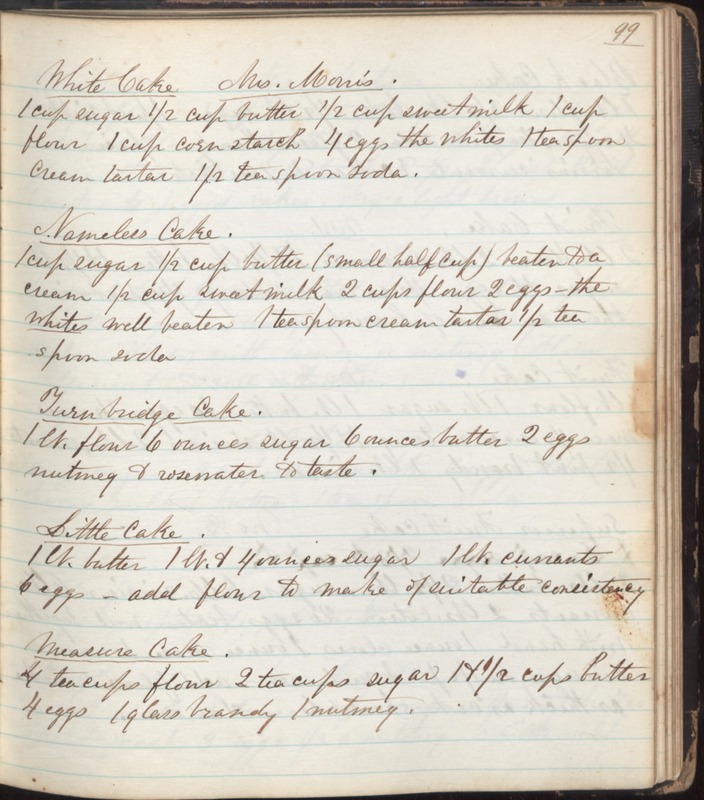 1 cup sugar 1/2 cup butter (small half cup) beaten to a cream 1/2 cup sweet milk 2 cups flour 2 eggs - the whites well beaten 1 teaspoon cream tartar 1/2 tea spoon soda Turnbridge Cake. 1 lb. flour 6 ounces sugar 6 ounces butter 2 eggs nutmeg & rosewater to taste. Little Cake. 1 lb. butter 1 lb & 4 ounces sugar 1 lb currants 6 eggs - add flour to make of suitable consistency Measure Cake. 4 teacups flour 2 teacups sugar 1 & 1/2 cups butter 4 eggs 1 glass brandy 1 nutmeg.